Nitric Acid is a colourless to light yellow fuming liquid at high concentrations, and a colourless liquid at low concentrations. When considering HNO3 safety, it is vital to remember that although it is a stable material, it will react violently with most metals. It is a strong oxidizer and as such must be kept away from organic materials. Materials to be avoided include strong bases, strong reducing agents, most common metals, alkalis, strong reducing agents, organic materials, alcohols and carbides. The acid corrodes steel and is light sensitive. When considering Nitric Acid safety, it must be remembered that Nitric Acid may be fatal if swallowed or inhaled. It will cause severe damage to soft tissue including nasal passages, the respiratory tract, the digestive tract, stomach and lungs. Contact with the eyes can cause serious long-term damage, whilst concentrated and moderately concentrated solutions are very 'Corrosive' and can cause serious skin damage. Contact with the skin or eyes may cause severe burns and can lead to permanent damage. Even dilute Nitric solutions should not be allowed to come into contact with the skin. Great care should be taken when handling the acid. 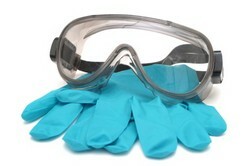 Personal Protective Equipment (PPE) should always be worn when working with any acid and this should include approved safety glasses, goggles or a face mask, gloves, protective clothing and safety boots or shoes. Gloves should always be worn and all containers should be handled within the confines of a fume cupboard as fumes from concentrated or Fuming Nitric Acid are very damaging. Whilst small amounts of the acid can be safely flushed down the sink with large quantities of water, it is essential than larger spillages are dammed, neutralised with sand, earth or other inert material and disposed of correctly. For any large spillages, the Emergency Services, the Environment Agency or other authorised organisation should be informed so that the acid is prevented from entering waterways or sewers. The acid can affect the pH of water and thereby cause damage to aquatic organisms. Depending on the concentrations of Nitric within a solution, Nitric Acid is also known as Fuming Nitric Acid, Fuming Spirit of Nitre, Fuming Aqua Fortis and Fuming HNO3. The material is referred to as fuming when it contains more than 86% Nitric Acid. Fuming Nitric Acid can also be White Fuming Nitric Acid or Red Fuming Nitric Acid depending on the amount of Mitrogen Dioxide present in the solution. Further information on this can be found on the Fuminf Nitric Acid and Fuming HNO3 pages of this website.